Twenty years ago, Amy Rohyans Stewart walked through the doors of St. Luke’s Children’s Hospital in Boise, Idaho, as a child life intern. Today, she is the hospital’s Clinical Supervisor and leads a team of 12 Child Life Specialists. On any given day, you can find Amy dancing in the hallways for pediatric patients, leading hospital tours, sitting bedside with children and their families, attending board meetings, or mentoring staff members. Most days, you’ll find she has done all of the above. 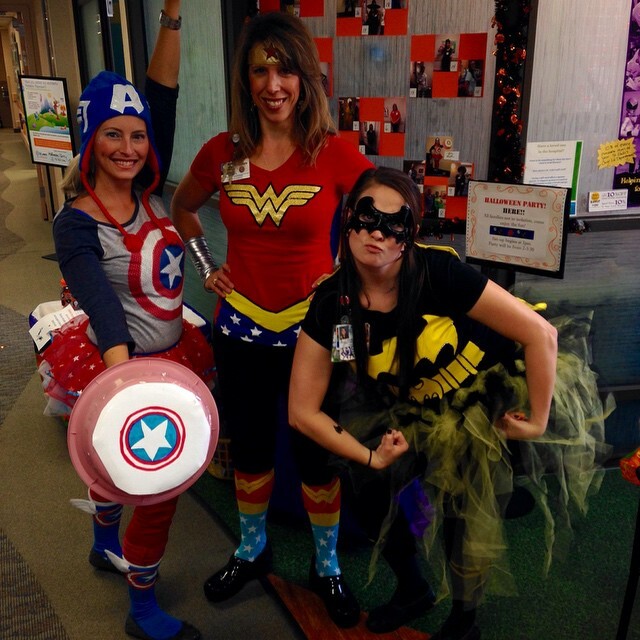 Child Life Specialists are an integral part of the St. Luke Children’s team. They provide emotional and developmental support to patients and their families and make sure the hospital is a safe and positive place to be. But with members of the team all over the hospital, it was difficult for families to distinguish them from other staff. So, Amy decided that all of her team members would wear purple. Now, when a family moves from one unit in the hospital to another, they know to look for the people in purple for help. One parent nicknamed the Child Life Specialists, “Purple Angels,” and the name has stuck. As a Purple Angel, Amy’s first priority is supporting the hospital’s littlest patients and their families. Whether you’re 10 months old and getting ear tubes placed or a mom in need of a hug, Amy makes sure you feel like you’re the most important person in the room. When a patient who was battling cancer learned her leg would have to be amputated, Amy helped prepare her for surgery through medical play. She brought a cloth doll, scissors, and bits and pieces of cloth into the room. Together, she and the patient cut off the doll’s leg and fashioned a beautiful prosthesis. Through the experience, Amy learned that the patient wasn’t afraid of the amputation but was actually nervous about the epidural. Amy was able to communicate those fears to the rest of the staff and make the surgery a positive experience for everyone. Over her two decades of experience at St. Luke’s, Amy has been a part of many advancements in children’s healthcare. Notably, she was the innovator who came up with the idea to have parents present for induction in pediatric surgeries. Instead of leaving parents outside of the operating room doors, a Child Life Specialist now guides them back to the surgical area with their child. Parents can stay with their child until the patient is asleep. This makes the surgical experience much less traumatic for patients and their families. Amy is originally from Montana. She enjoys laughing, telling jokes and giving hugs. When she is outside the hospital, she loves spending time with her husband, two children, and giant poodle.